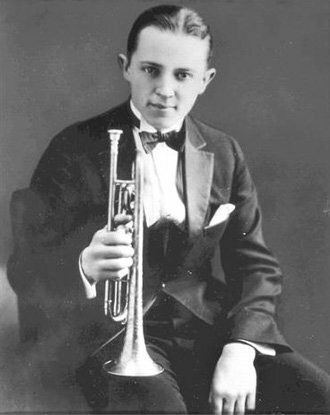 Bix Beiderbecke influenced early jazz with his lyrical, melodic style. Bix Beiderbecke played with lyric beauty and had a different influence than Louis Armstong. The German Midwest and European classical influence produced Bix Beiderbecke - a different type of trumpet player - lyrical, linear and pure in tone. Bix Beiderbecke was born Leon Bismark Beiderbecke. [b. Davenport Iowa, March 10, 1903] He grew up in a middle class German-American household in America's heartland. Bix was a dreamy boy who could pick out any tune he heard one time on a piano. Davenport is on the bank of the Mississippi River. This musical boy listened to the music of New Orleans on recordings of the Original Dixieland Jazz Band featuring their trumpet player, Nick La Rocca. He also listened to the never recorded Emmett Hardy, Louis Armstrong and others on the riverboats on the Mississippi. At home he had a classical piano playing mother and listened to European and European-American music. In school young Bix Beiderbecke was a lazy student unless a subject particularly interested him. His parents sent him to piano lessons early on. However he learned his lessons by ear and committed them to memory easily. His piano teacher wanted Bix to learn traditionally by reading music. A flustrated teacher and frustrated student parted ways and Beiderbecke never did learn to read music with any great skill. Beiderbecke's parents sought to improve Bix's study habits and discipline by sending him to a private school in suburban Chicago - Lake Forest Academy. His move to Chicago coincided with the diaspora of New Orleans musicians arriving in Chicago. These musicians came north for better economic opportunities. King Oliver , Jimmy Noone, Louis Armstrong and others were playing hot [emotional] jazz in Chicago. Bix was soon sneaking off campus and traveling into the city to listen to these early giants. His stay at the boarding school was cut short by his lack of academic effort and his unauthorized trips into Chicago to listen to the developing music called jazz. In 1923 Beiderbecke was in a band of of mostly schoolmates called The Wolverines. He made his first recordings in Indiana with this group. He went to New York and returned to Chicago in 1925 and played in a commercial orchestra. When he was not playing commercial music, he sat in with Louis Armstrong, King Oliver and others. In 1926 Bix was playing with saxophonist Frankie Trumbauer. Bix's greatest rccordings happened with Frankie Trumbauer and one lineup or another. He then worked with the hottest white band of the time - Jean Goldkette in Detroit. From 1928 to 1930 Beiderbecke was a featured soloist in the Paul Whiteman Band - the most popular band of the time. Whiteman did not play jazz, but rather played "jazzy" popular music. With both Goldkette and Whiteman, Bix had trouble because he never learned to read music well. But the greatest trouble for Bix was his alcoholism. It harmed his tenure with the bands, took away his heallth, and killed him in August of 1931 at the age of 28. He taught himself to play trumpet and had what his contemporaries said was a most beautiful tone. Eddie Condon said Bix sounded "like a girl saying yes". Louis Armstrong said "I'm telling you, those pretty notes went right through me." Armstrong played wildly inventive solos based on chord structures and full of arpeggios. He swung the beat dramatically and used many different tones for emotional, musical effect. Bix played solos improvised on the melody more like a reed player. His structure was more linear and less based on chords. His beautiful tone did not vary much and he swung, but he swung very close to the ground beat. His ideas were influenced by the modern classical composer, Claude deBussey. Great solos by Bix Beiderbecke include "Singin' the Blues" and "I'm Coming Virgina". The style of Beiderbecke and Trumbauer influenced many, including Rex Stewart, Benny Carter, Johnny Hodges and Roy Eldridge. Lester Young carried "Singing the Blues" with him in his sax case and through Young they influenced Miles Davis and also the West Coast cool jazz of the 50s. Bix Beiderbecke's cool lyricism tempered the hot bravura of Louis Armstrong's influence in early jazz.